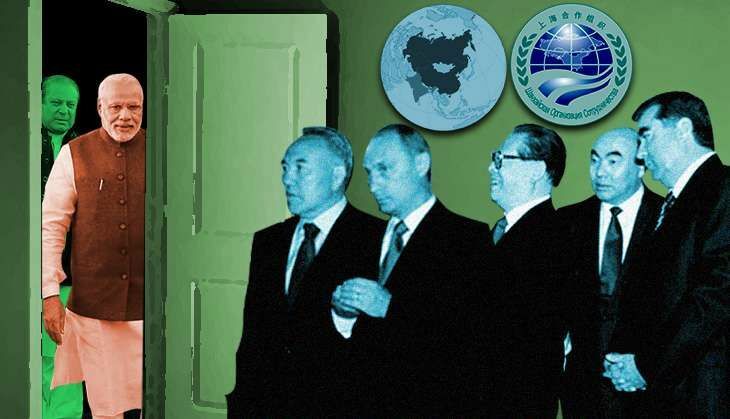 The ball for the expansion of Shanghai Cooperation Organisation (SCO), since its establishment in 2001, was set rolling at its summit in Ufa, Russia last July with the acceptance of applications by India to join. The process was taken forward at recent summit in Tashkent on 23 and 24 June, with the signing of the 'Memorandum of Obligations' by the two countries. Over the coming year, India will sign around 30 documents and join as a full member at the next summit in Astana, Kazakhstan next June. Since its establishment, SCO has concluded several wide-ranging agreements on security, trade and investment, connectivity, energy, SCO Bank, culture etc. Their implementation however has remained uninspiring. This is partly because SCO lacks coherence. Having been created at China's behest with Russian support, SCO is still grappling to evolve as a well-knit entity. Nevertheless, the significance of SCO cannot be underestimated because it straddles large territorial, geo-political, strategic and economic space and strength. India's membership will add significant heft and muscle to the organisation particularly in the backdrop of the anemic international economy. India is the fastest expanding global economy today with annual GDP growth of 7.5%. It represents the-third largest economy ($8 trillion) in PPP terms and seventh-largest ($2.3 trillion) in nominal dollar terms. It inspires confidence on other indicators such as FDI, inward remittances, savings rate, pace of economic reforms etc. Its large market, favourable demographics and technological prowess augur well for economies of the grouping. Its growing energy demand promises an assured market to resource rich (oil, gas, uranium, coal) Central Asia and Russia. SCO will need to assume responsibility to provide security in Afghanistan in aftermath of withdrawal of the United States and Nato-ISAF forces. India will be able to play its due role in stabilising the situation in Afghanistan which is assuming disturbing proportions due to the Taliban's increasing attacks. Terrorism and radicalism are the most formidable challenges confronting the region and international community today. India has been the victim of terrorist attacks for the last 30 years. Battling terrorism has provided invaluable perspicacity to the Indian security establishment in intelligence gathering, training, foiling terrorist operations etc. Threat of terrorism to the region is particularly grave on account of continuing violence in Afghanistan which can embolden regional groups like Islamic Movement of Uzbekistan, Hizb-ut-Tahrir etc to destabilise governments in Central Asia. Scourge of radicalism also looms large over the region with expanding influence of Islamic State (IS) and reported desertion of several cadres of Taliban, Al Qaeda etc to join the jihadi IS ranks. Several hundred young men and women have fled their homes in Central Asia to bolster IS forces that are spreading to Central Asia, Pakistan and Afghanistan. India can share its experience of handling the twin scourges of terrorism and radicalism with SCO members to mutual benefit. India can also enhance its engagement with the Regional Anti Terrorist Structure (RATS) based in Tashkent. Central Asia is part of India's extended neighbourhood. The countries have however failed to realise the immense potential in promoting security, political, economic, trade, investment and energy ties because India does not share common land-borders with the region. Another reason is lack of frequent visits at the highest level to Central Asian States. SCO membership will provide a welcome opportunity to Indian prime ministers to meet presidents of Central Asian States regularly and frequently. India's potential participation in Eurasian Economic Union (EEU) will add further value to the partnership. To obviate the lack of direct land connectivity with Central Asia, and Pakistan's refusal to provide access through its territory, India is actively collaborating to develop the Iranian seaport of Chabahar with possible financial and technical support from Japan. Agreement to develop Chabahar and associated rail-network at a cost of $500 million was signed by PM Modi with the presidents of Iran and Afghanistan during his recent visit to Iran. India has also prioritised the construction of the International North-South Transport Corridor. Central Asia represents the 'near-abroad' for Russia. Both India and Russia can collaborate to reciprocal benefit in several areas including agriculture, SMEs, pharmaceuticals, IT etc. India has demonstrated its determination to strengthen its multi-faceted relations with Central Asia through the historic visit of PM Modi to the five Central Asian republics in July, 2015. Several Agreements were signed. Turkmenistan, Afghanistan, Pakistan, India (TAPI) gas pipeline whose construction commenced in December, 2015 is a bright example of a mutually beneficial project. Some commentators have expressed concern that induction of India and Pakistan could shift the focus of SCO from Central Asia to South Asia and could disrupt SCO's smooth and consensual functioning by emphasising on India-Pakistan bilateral territorial dispute. But this appears highly unlikely. India's only objective is to engage with SCO members to promote peace, security, connectivity, energy trade, people-to-people contacts and economic development in the region. Some Chinese analysts opine that India and Pakistan's membership will provide a role to SCO to mediate their boundary dispute. The argument advanced is that SCO's predecessor was established to demarcate boundaries between its member states. It successfully achieved this. However, this appears to be wishful thinking. India has made it abundantly clear that there is no role for third-party mediation in India-Pakistan conflict. Resolution of this is possible only when Pakistan stops using terrorism as an instrument of state policy. India will have to guard up against a strong push by China for SAARC membership. The next SAARC summit takes place in Pakistan on 9 and10 November. China can be expected to reach out pro-actively to all SAARC members, several of which are supportive of China's bid. India will need to stand firm against China's entry into the South Asian body. India's membership of SCO is a win-win proposition for the organisation, for Central Asia, for Russia, for China as well as for India. Members will reap huge benefits if they conduct themselves with responsibility.